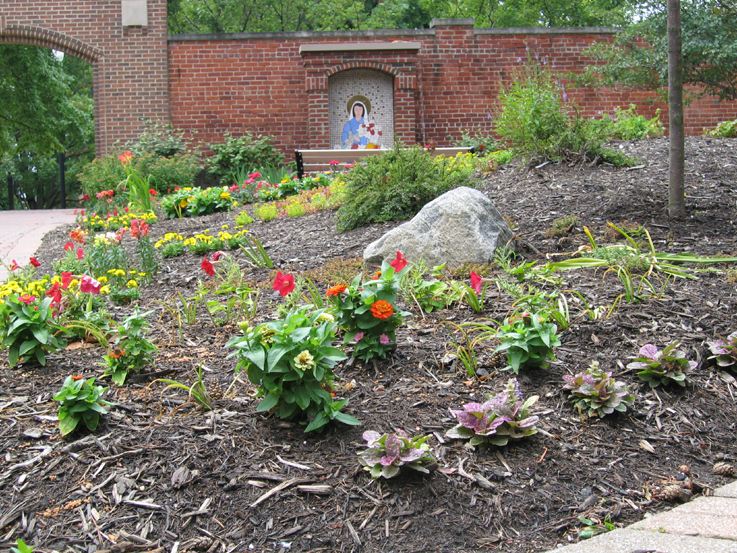 In 2004, at the behest of the Vice President for Finance and Administrative Services at the University of Dayton, Tom Burkhardt, a garden began to take shape in the courtyard bounded on the north by St. Mary's Hall and on the South by the Chapel of the Immaculate Conception. 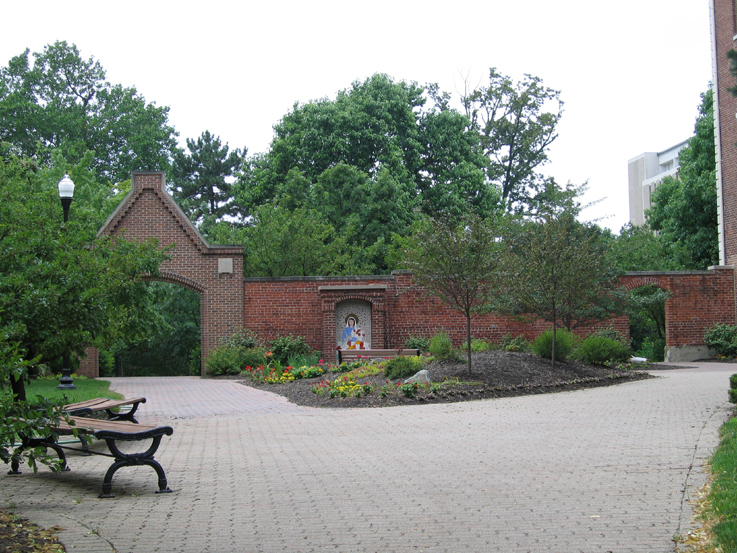 This special garden was to be "owned" by the faculty, staff and students of the University of Dayton, to be one they could claim as their own. 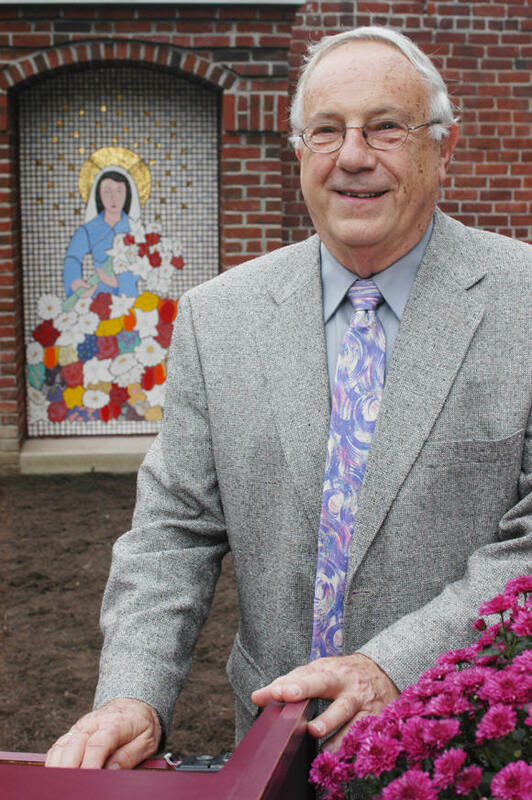 As Mr. Burkhardt's favorite garden plant is the daffodil, in the fall of 2004, over 2500 daffodils and about one thousand tulips were planted in the courtyard and the idea began to take shape. 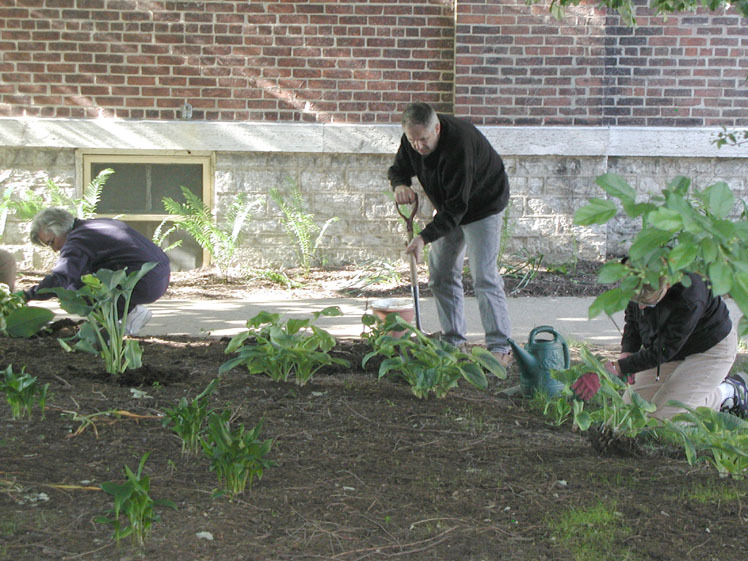 From the beginning, a core group of faculty and staff persons have been involved in planning for, planting and nurturing (including keeping up a schedule of watering during the hotter days of summer) this space. 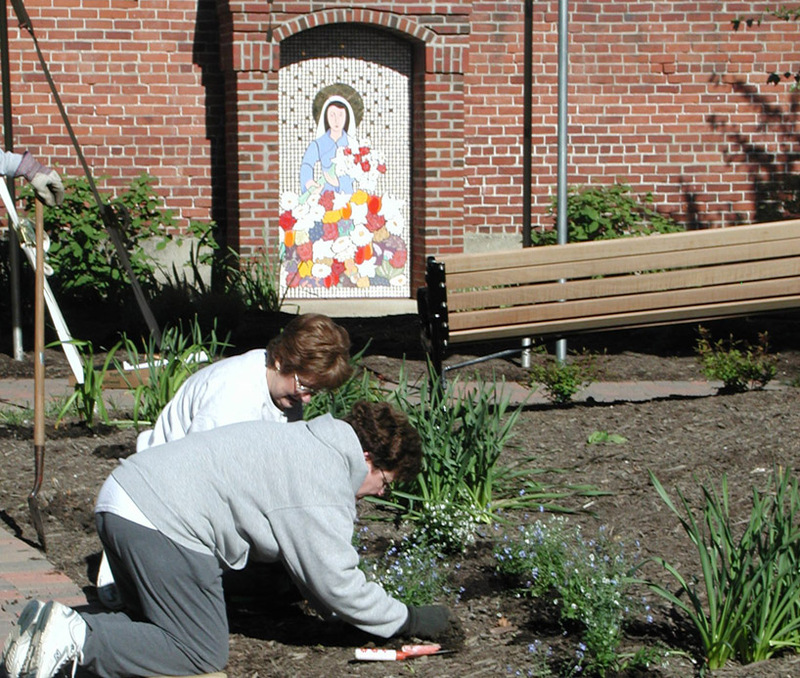 It seemed only natural to name the garden after the two Mary buildings on her flanks; thus the Mary Courtyard Garden was christened. 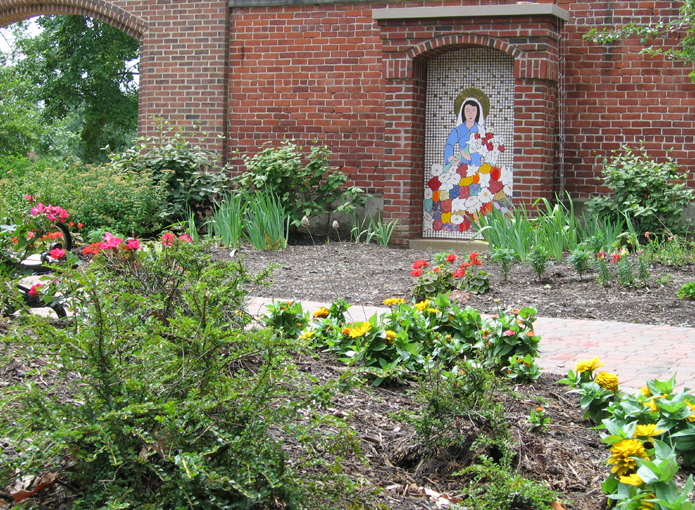 Furthermore, the planning group wished to have some icon of the Blessed Virgin Mary as a centerpiece for the garden. Bro. 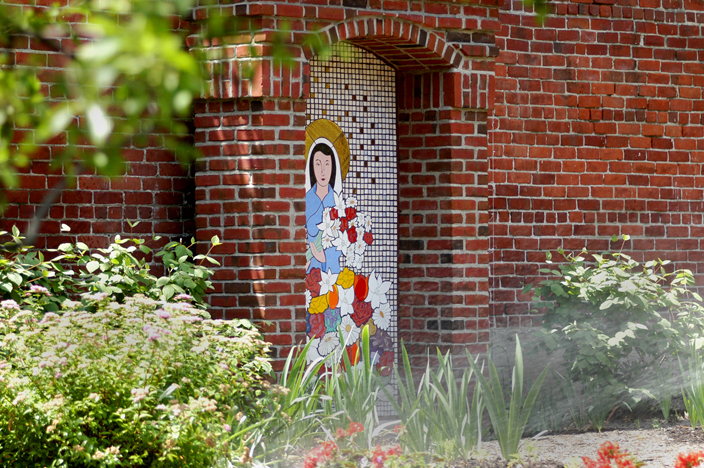 Don Smith, S.M., a Marianist brother and artist, was commissioned to create a mosaic shrine reminiscent of the wayside shrines one finds in out of the way places in Europe and even in America. 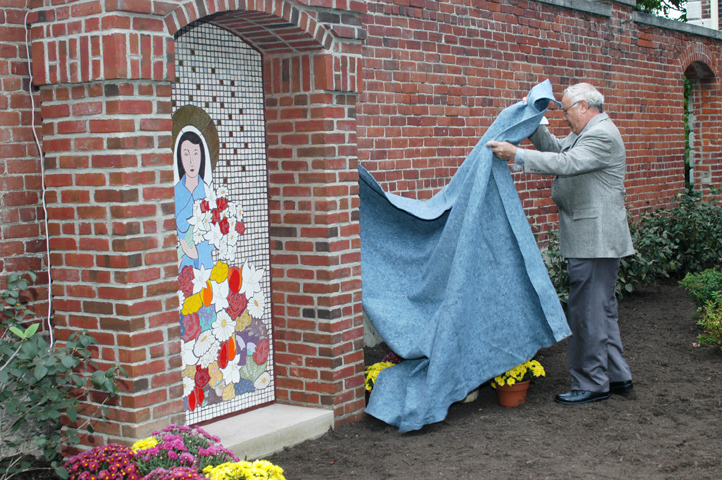 On October 12, 2005, the mosaic was completed and a dedication ceremony was held. Fr. 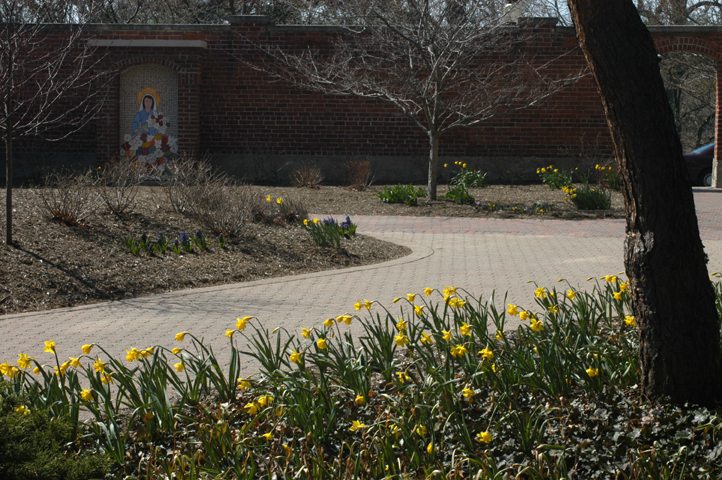 Paul Marshall, the Rector of the University, gave an invocation and blessed the areas that would be planted with flowers, shrubs, ground covers and trees. 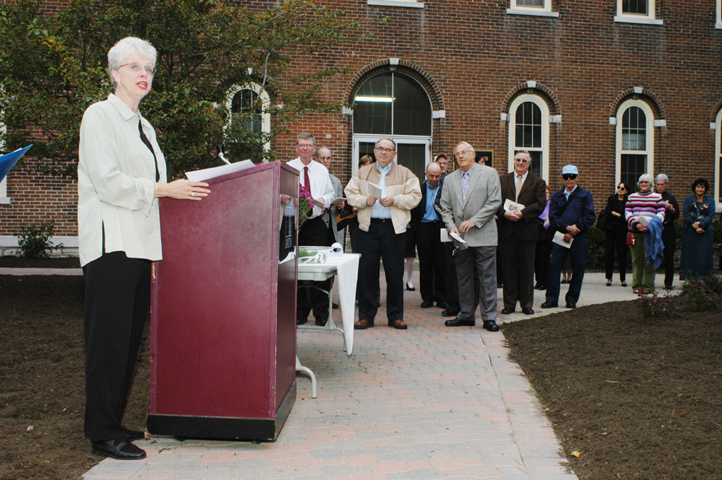 A number of people attended the event which included music and prayer and was blessed by lovely fall weather. 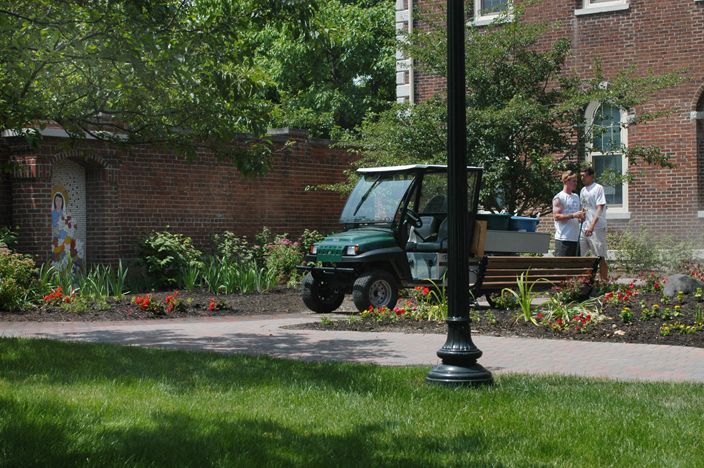 The designer of the courtyard was Lisa Oates-Campbell, Ground Work landscape architect. Lisa was already familiar with the U.D. 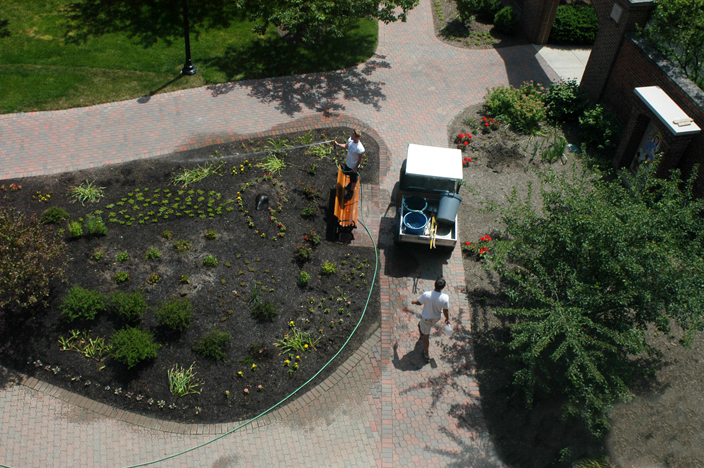 campus as she was also the designer of Serenity Pines garden on the hilltop area between Marycrest Hall and Gosiger Hall. 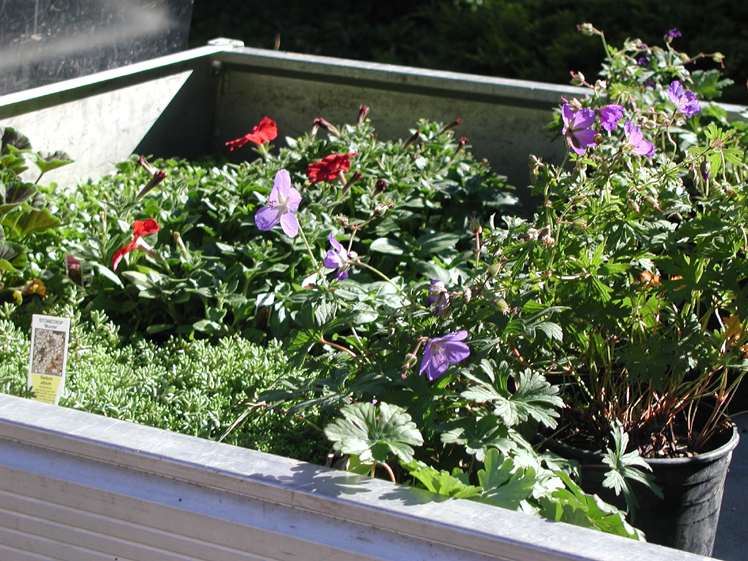 Lisa's design plan makes use of "Mary plants" throughout and capitalizes on already existing plantings. It includes lighting and seating as well as future plans for a possible outdoor classroom area. 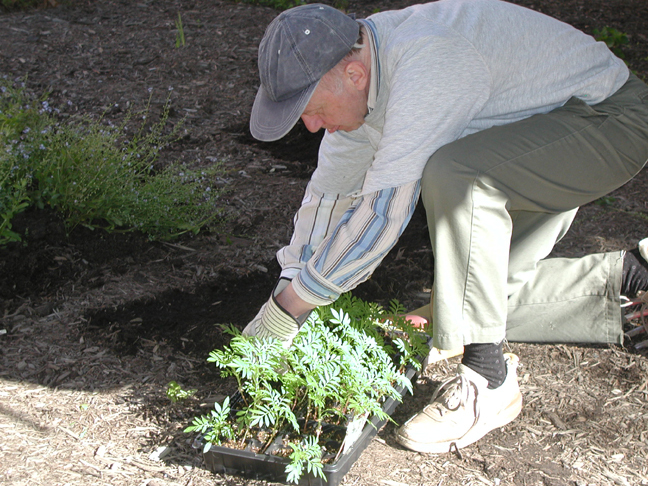 In the fall of 2005, the planting group met again on a brisk November day and planted even more spring bulbs. 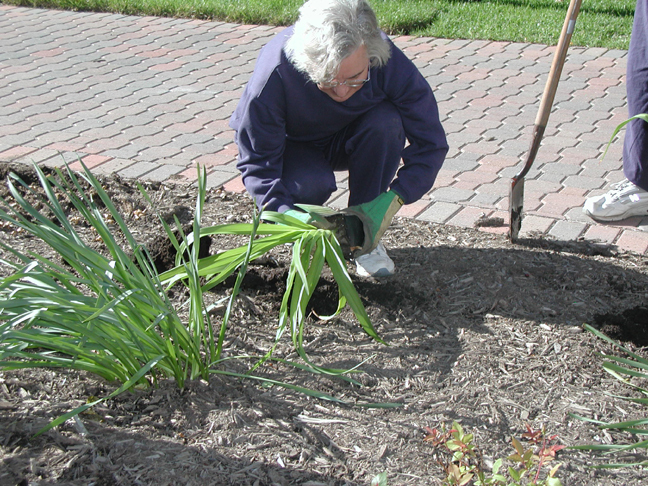 By this time, a mounded area had been shaped in the center of the mostly flat terrain to add interest and was topped by some trees and shrubs including knockout roses that would add spring and summer color to the garden. 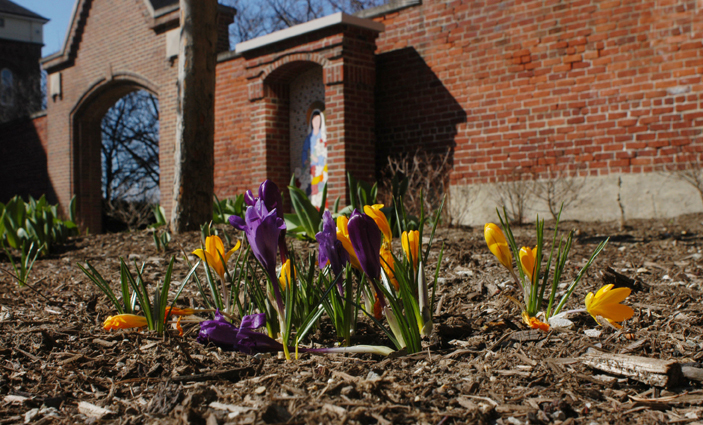 Spring of 2006 was glorious for its colorful bulb display which now included more daffodils, tulips, crocuses, hyacinths, grape hyacinths and other bulbs. Such blossoms were set off by newly planted flowering crabapple trees. 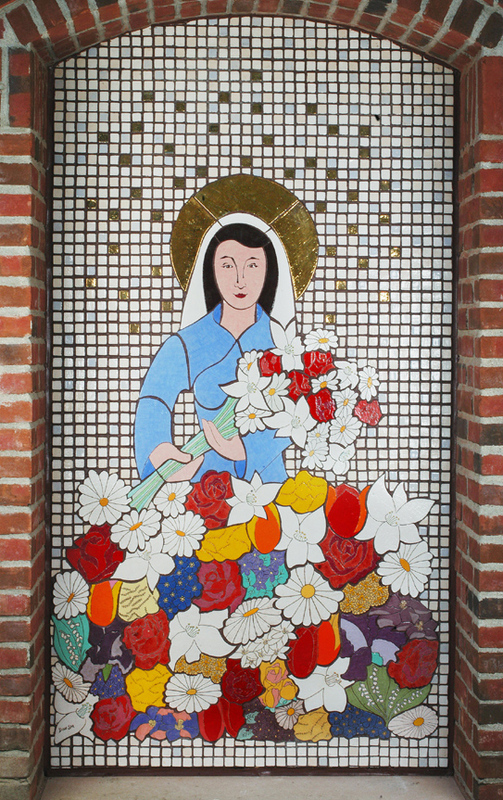 The fragrance and color was a lovely counterpoint to the colorful mosaic. 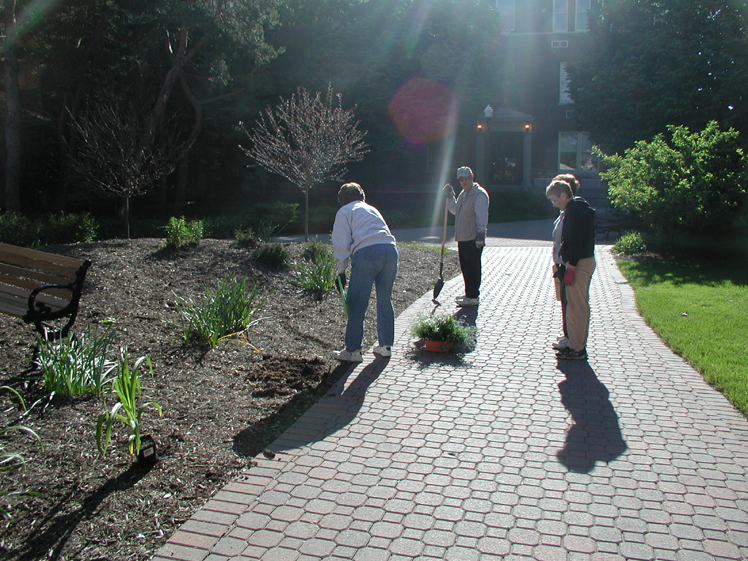 Later in the spring, in early May, more planting took place, again involving the volunteer group of faculty and staff as well as facilities personnel who lended helpful hands and ideas. 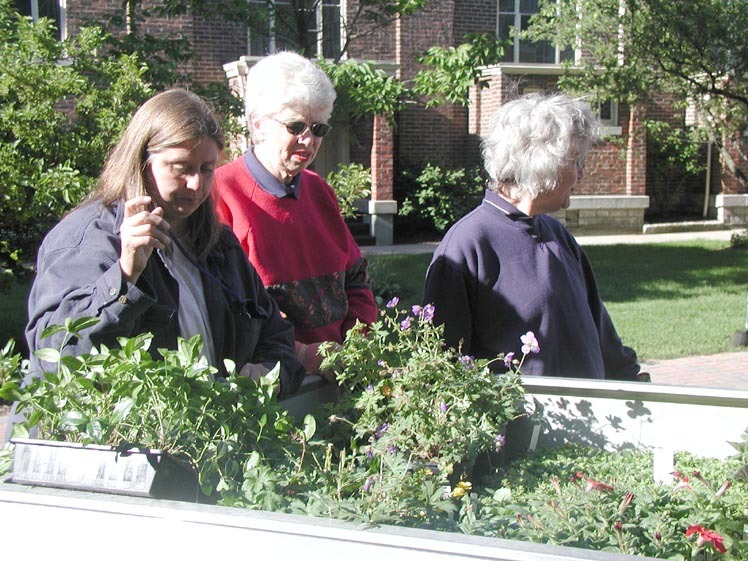 Additional perennials donated from UD associates' own backyard gardens were planted and a small truck full of annuals was added. By mid-June the garden, though only a fledgling, shows signs of its desire to grow up to be a showy spot where rest and contemplation are invited. 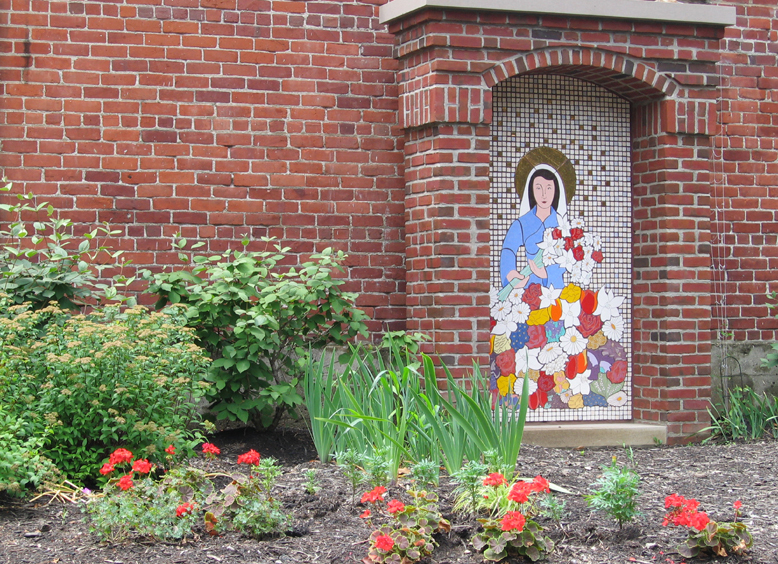 New lighting fixtures have been added and a garden bench was donated that faces the mosaic so as to invite passersby to sit and rest and enjoy the beauty of the shrine. All are welcome to this campus avenue that crosses between the busy classroom buildings and the main library and Law School, music and physical education facilities. Please take time to stop and admire or sit a bit and enjoy the show!